A week ago, you’d have seen it on the news, and every phone shop or Apple Store you’d walk past, queuing for the 6S, and in Lincoln it was no different. 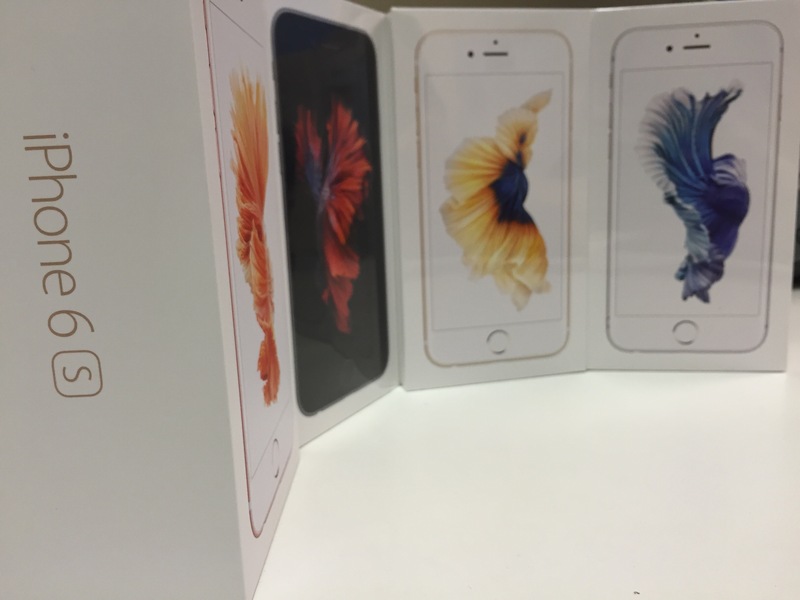 I’ve had the 6S since launch, and there’s some thoughts I’ve gathered since then. The iPhone 6S is the latest in the iPhone line, being the ninth model released ever since its launch in 2007, and in the UK the following year. There are two main features this year; Camera and 3D Touch. One an evolution, another a revolution that isn’t immediately obvious. I’ve seen the iPhone as a reboot and a sequel every two years. You get the same character, but in a different form, while the S model is the sequel; familiar, but bigger and better than before. As soon as you take it out of the box, you know it’s slightly heavier and thicker, which is a good thing to me, as you have a better grip holding it, especially when 3D Touch comes into play. It will fit the majority of cases, although it may be an idea to see whether the thick screen protectors will be able to not be an issue for 3D Touch. It comes in the same colours as last year, but with a ‘Rose Gold’ option as I’m sure you’ve now seen. It’s a colour that i personally like, and looks a darker shade than it does on the box. If I didn’t have my pre order for a Space Grey 128GB, I may have been tempted for this colour. I’ve always said that the megapixel isn’t what makes the camera great, but the sensor, the lens, and the processing as soon as the picture is taken. With this, it’s why Apple have kept the megapixels at 8, but still improving the quality year upon year. This time, it’s gotten to a point where the camera can now benefit the increase to 12 megapixels, with a brand new camera, and with 4K video recording. This is a HD video, but four times the size. Definitely great to use for captures of short moments. It’s coming to fruition now where you’re not only paying for the internet services, the software and the speed that the iPhone comes with, but now a high-end quality camera that is starting to ascend most mid-range SLR cameras. The shots I took above are ones I just pointed and press ‘shoot’. No Adobe or Aperture to have the cathedral in a good light, the sensor did all the work for me. Live Photos is becoming something I can’t use an iPhone without. The best way I’ve discovered to describe them, are how the moving pictures look in the Harry Potter films when you see a character read a newspaper. You press the Live Photos icon at the top, you take the photo, and after 3 seconds, you then view the photo. These can be seen on a device that can work on iOS 9 or the Apple Watch, so they’re not restricted to be viewed on the 6S alone. One tap and they play as they do on the 6S. You can also assign these as a wallpaper. I’ve already done 5, some being taken from a favourite game of mine, or when I saw a band play live. One touch will take you to a setting or the next level, that’s always been the case. Now though, you can force press it, or hold it down for a longer period with pressure, and different outcomes will occur. If you force press an Apple app icon on the home screen,a shortcut will appear, giving you a house to go to different menus in the app without having to quickly search for it. Apps such as Shazam and Twitter already support it, so you could quickly see what the song being played near you is called, or quickly tweeting. You could ‘peek’ a new message or email for instance, and then go back to what you were doing. Or, you could ‘peek’ at a new message, and if you wanted to reply, pressing harder would take you to the full message. It’s a quicker, much more efficient way of managing your new messages. One feature I find really useful is the trackpad feature. Force pressing the keyboard allows it to turn into a trackpad by using your thumb to move the cursor to a particular word, saving you the time to tap on a word, delete it, and then replace it. E-mail benefits the most here, where you can ‘peek’ on a new message, and then slide to the left to move it to the trash if the content of the e-mail isn’t what you want to see. 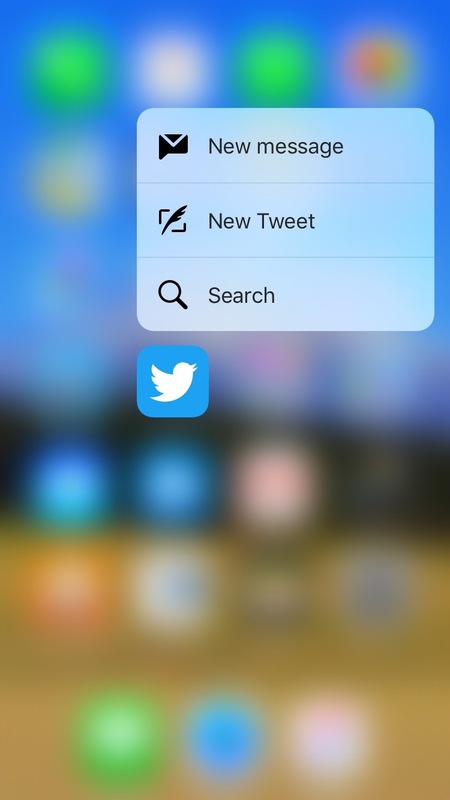 3D Touch is also beneficial for Accessibility. 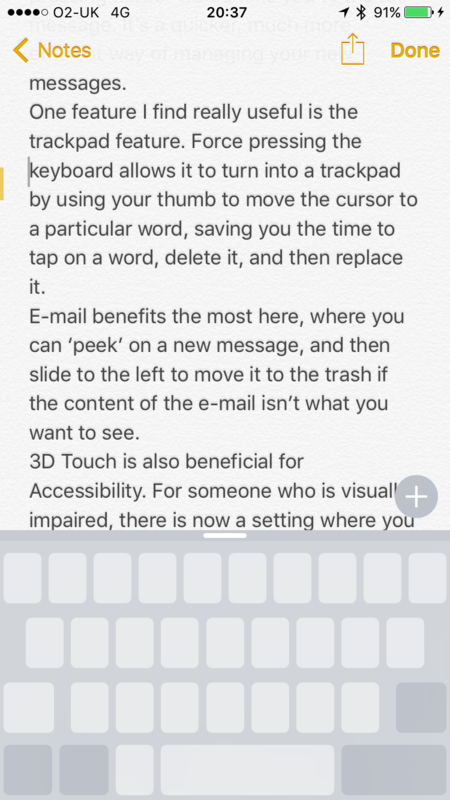 For someone who is visually impaired, there is now a setting where you can use a ‘Zoom Controller’ to force touch the magnified area that appears, allowing the user to easily see that instead of using a slider to zoom in and out. The smaller features which are noticeable right away, such as TouchID, is much faster than previous. I’ve had moments where I’ve wanted to reply to a Twitter mention, and it’s already brought me to the home screen. If you want to show Live Photos on your lock screen, press the power button from now on. Launching intensive apps such as iMovie, or games like Tomb Raider II are much faster, due to the near-double speed of the A9 chip inside. In my experience, the battery life is slightly better than previous, mainly down to how iOS 9 has been tailored to managing power this year. But using iOS 9 on my older iPhone 6, it’s gotten better at managing apps in the background, music especially. Overall, it may be a sequel, but it’s definitely a sequel worthy of being called ’The Dark Knight’. It’s the same on the outside but incredibly different on the inside, and as it’s the first ‘S’ iPhone I’ve had, I’m glad I upgraded this time.